A properly designed color viewing system takes into consideration the output and color quality of the lamps. In order to assure excellent color rendition and tight tolerance visual agreement, all GTI color viewing systems utilize our Graphiclite 100 Color Viewing Lamps. 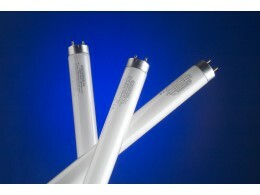 GTI Graphiclite 100 lamps are manufactured with a unique blend of fluorescent phosphors that is unequaled by any other 5000 Kelvin lamp in the industry. GTI lamps produce a true full spectrum white light which renders colors with the highest degree of accuracy and efficiency. When used in GTI viewing systems, the Graphiclite 100 color viewing lamp produces an actual system CRI approaching 95. GTI viewing systems include a reflector, diffuser, the booth structure, geometry of illumination, and Graphiclite 100 lamps. A change in this system’s formulation can create a slight color cast that will impact color assessment, resulting in a viewing environment that is not ISO compliant. To maintain an ISO 3664:2009 compliant viewing system, use only GTI Graphiclite 100 color viewing lamps and relamp regularly. A lamp’s color output and intensity changes over time. To maintain consistent and accurate viewing conditions, viewing stations should be relamped after every 2,500 hours of use. GTI Graphiclite viewing stations should be relamped only with Graphiclite 100 color viewing lamps. Relamp kits are available for all GTI viewing systems. Our relamp guide will help you select the right relamp kit by entering either the viewing system model number or the lamp type and quantity.